Are you looking to grow your circles on Google+? Do you want better SEO and increased website exposure? Then this is the place to be! 3. Share a post on Google+ and include the hashtag #mommyiscoocoo. 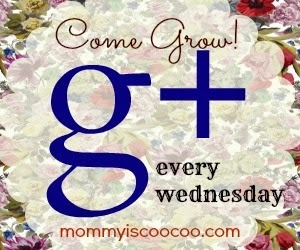 *If you want to grow your presence on Google+ email Amanda at mommyiscoocoo(at)gmail(dot)com to cohost. I don't even think I am on Google+???!! i'll have to look into this!